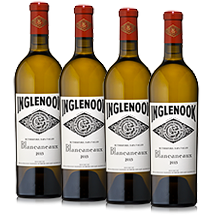 Just a small amount of white wine is made from the historical Inglenook property. We have created from our six acres of white wine grapes that get the full morning sunshine and the shade of Mt. St. John in the afternoon, this beautiful full body Rhone style of Viogner, Roussanne, and Marsanne.